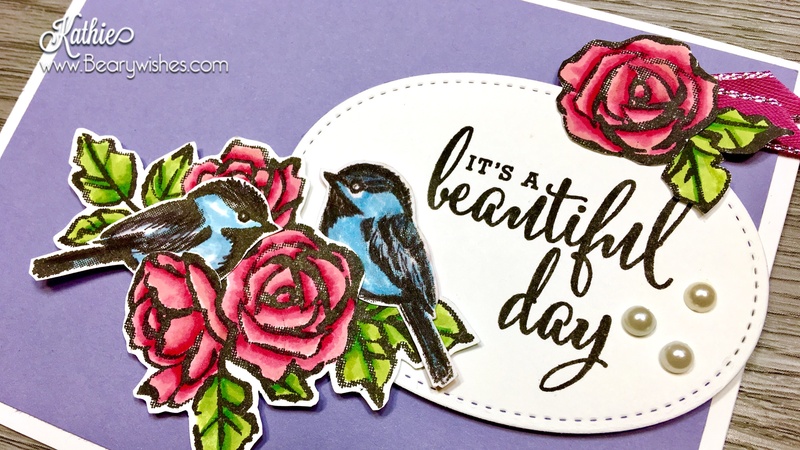 Petal Palette Beautiful Day Blog Hop Stampin’Up! Welcome everyone! We joined forces with Happy Inkin for this weeks blog hop, this mean its a Joint Blog Hop so you are in for a real treat! 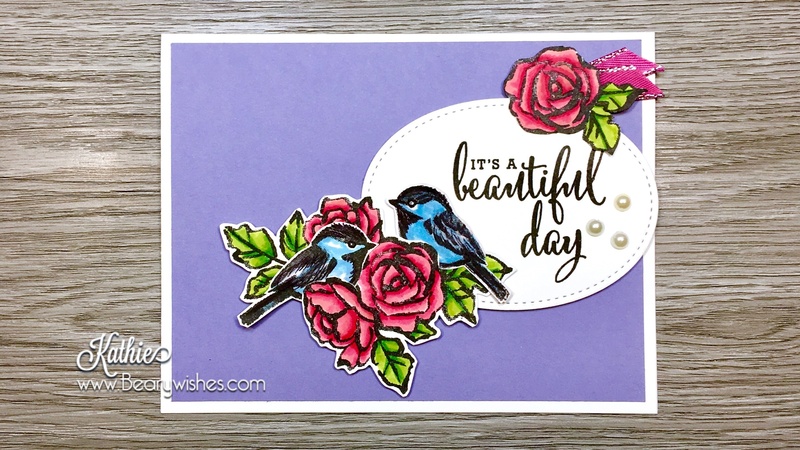 Todays card share features the Petal Palette stamp set. Its a cute set and I love the little birdie! 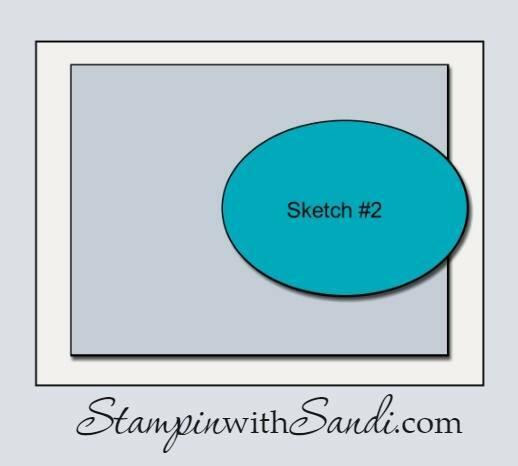 This week for the Happy Stampers group, we have a sketch challenge. 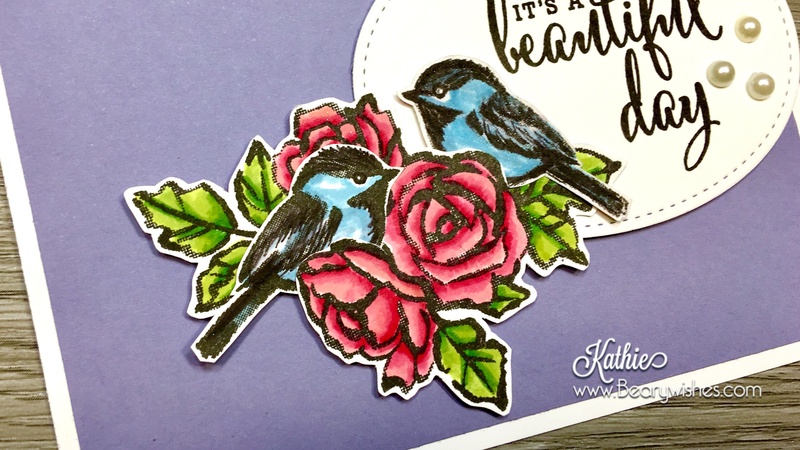 I wanted two birds on this card facing each other and to create the second bird, I stamped the bird stamp on a piece of acetate and rubbed card stock over it. It turned out pretty good for my first time! I added a bit of detail on the bird using the Black Stampin’Write Marker and coloured them with Balmy Blue (new). I did leave a few areas uncoloured for highlights and then I fussy cut them out. I stamped the flowers from the set with Memento Black ink and coloured the flowers with Lovely Lipstick (new), Melon Mamba and Blushing Bride. The leaves were coloured with Garden Green and Lemon Lime Twist and I fussy cut out the image. I did create a single flower thats at the top of the oval. Speaking of which, I tucked behind the flower a little piece of Berry Burst ribbon too. Back to the flower piece, I snipped a couple of the flowers and tucked the birds behind the flowers to create a bit of dimension. I used the largest oval stitched die to create the oval to follow the sketch and all the pieces were raise with dimensionals. I backed it onto a Highland Heather (new) panel and adhered it to a side folding card base in Whisper White and accented it with 3 Basic Pearls. Up next is Eva. Click the NEXT button to check out her project. Here is a list of all the hoppers! Hope you enjoyed todays card share and thanks for hopping with us! Thanks so much. Thanks for stopping by! haha, great minds think alike, beautifully done kathie, I love that you added the birdies, they are adorable. Oh my! What a wonderful technique and design to create those two birds!! Love how you tucked them into the flowers. Perfect! This is so beautiful Kathie! Looks like you and Sandi were thinking alike…love the little tucked in ribbon behind the flower, too!!! Love the birds!! So pretty, great job . Bright and Cheery! Also wanted to say …. thanks for hopping along with us. !!! Thank you Shelagh! Appreciate your comments! Beautiful card, Kathie. Love the way you reversed the bird so they could face each other. Fun to be in a hop together. I love your birdies and the colors you chose. So bright and beautiful.